On this page you can find answers to most of your question. Click on a question to read the answer. What are the prices to purchase an ACLO Card? Here you can find more information about the prices. How long is my ACLO Card valid? Your ACLO Card (or Midseason or Summer Card) is valid until the end of the college year (until September of the following year). You don’t have to sign out at the end of the year. Every year you have to purchase the ACLO Card again, when you want to continue your membership. When and how do I receive my ACLO Card? Your ACLO Card is not a card itself. The ACLO Card is registered on your student card. When we scan your student card, we can see whether you have purchased an ACLO Card. So bring your student card with you when you visit the ACLO. Can I purchase an ACLO Card, when I don’t have my studentcard yet? When you don’t have your studentcard yet, but you do have a studentnumber and password, you can purchase an ACLO Card online at MyACLO. If you don’t have your studentnumber and password yet, you can go to the information desk of the Sports Center and bring a letter of acceptance of your education institution. I purchased an ACLO Card some time ago, but I haven’t heard anything yet. How is this possible? Due to an error in the system not every student receives a confirmation. After you purchased an ACLO Card, your sportscard will be connected to your studentcard. This is why you always have to bring your studentcard when you are going to sport at the Sports Center or the WAS complex! Can I buy an ACLO Card for just a part of the year? You can buy an ACLO Card during the year for €59,95. This card is valid until September. With this card, you can become a member of one of the sport associations of the ACLO. If you want to use the ACLO facilities from the 1st of February until September, you can buy a Midseason Card for €49,95. It is also possible to become an ACLO member from the 1st of May until September with the Summer Card. This Card costs €24,95. With the Midseason Card and Summer Card, it is not possible to become a member of one of the sport associations of the ACLO. If you are an exchange student and only in Groningen for the first semester, it is possible to buy an Exchange Student Card for €49,95 at the desk of the Sport Center. Please bring your proof of enrollment with you. You can use the fitness facilities with an additional Fitness Card. A Fitness Card for the whole year costs €65,-, from the 1st of February until September €40,- and from the 1st of May until September €19,95. You will have to possess a valid ACLO Card, if you would like to purchase a Fitness Card. You can purchase the Midseason or Summer (Fitness)Card online or at the desk of the Sport Center from the first day these cards are valid. Can I purchase an ACLO Card when I am graduated? If you were registered at the RUG or Hanze University for Applied Sciences last year and you had an ACLO Card, you can purchase an ACLO Card again, but this time for €134,95. If you have never bought an ACLO Card before, you have to bring your old studentcard or your letter of acceptance of your education institution to the information desk of the Sports Center. If you are an alumnus of the RUG or Hanze University for Applied Sciences you can purchase an ACLO Card for €134,95 until three years after graduation. You have to bring your approve of graduation with the date of graduation and your ID to the information desk of the Sports Center. I would like to join a sport club. Do I have to purchase an ACLO Card? Yes, you will have to purchase an ACLO Card for €59,95, regardless of when you are becoming a member of the association. Please purchase this Card within two weeks after enrollment at the association to avoid receiving a fine. When you have purchased an ACLO Card, you can select the association at MyACLO under ‘Profile’ . It is not possible to join a club with a Midseason Card, Summer Card, SPR-membership or with an Exchange Student Card. In these cases you will have to purchase an ACLO Card instead of these Cards. How can I purchase an ACLO Card? You can purchase an ACLO Card during the whole year. This is possible via iDEAL: https://aclosport.rug.nl/en/home. You can also pay by card or cash at the information desk of the Sports Center. Don’t forget to bring your studentcard when you are going to sport at the Sport Center or WAS complex! Where is the ACLO Station? For a more precise description of the location of ACLO Station, click here! Do I have to enroll for a Groups lesson? You do not have to enroll for the Groups lessons at ACLO Sport Centre at the Zernike complex. When you want to join a Groups lesson, you can just come by and sport. In the contrary to the groups lessons at the ACLO Sport Centre at the Zernike complex, it is obligated during the groups lessons at ACLO Station to reserve a ticket 48 hours prior the groups lesson. This is to make sure that the accommodation will not get too crowded, this means that there is a limited amount of tickets available for each groups lesson. If you want to be sure that you can participate in a groups lesson at the new location of the ACLO, you will have to reserve a ticket via MyACLO. Go to ‘Bookings’, select ‘ticketuren aclo station’ under ‘Sport’. More information about the ticketsystem: http://www.aclosport.nl/en/about-aclo/aclo-station/. I’m interested in weight training, where can I find more information? The Power Station near the Central Station of Groningen is 180m2 and is designed for the purposes of the strength athlete: free weights, platforms and squatracks. There are no cardio-machines in the actual gym. However, you can use the free Cardioplaza in the room, at ACLO station. In ACLO Station you can use the facilities of Power Station with your Fitness Card. The Fitness Card costs €65,- for a whole year and is valid for the Fitnessfacilities at ACLO/Sports Center Zernike and for the Power Station. More information about the Power-introduction and purchasing the Fitness Card you can find here. Where can I find the schedules for the open hours and courses? You can find the schedules at the website under schedules, but you can also find them at the entrance of the Sports Centre on the right wall. I have enrolled myself for a course. Do I have to bring any materials with me? In most cases this is not necessary. At MyACLO you can see whether you have to bring your own materials to a course. How can I cancel my course enrollment? You can cancel your course enrollment by not paying an attendance deposit. Other students can enroll in your place in the post-enrollment period. You can also cancel your enrollment at MyACLO. What is the procedure for the post-enrollment? From Thursday until Sunday in the week before the start of the course there will be an extra enrollment period for all open places in a course. You can enroll at MyACLO. However, you are only placed in a course if you have paid your attendance deposit online or at the information desk of the Sports Centre. First come, first served. If you don’t pay your deposit in time, your enrollment will expire. Post-enrollment is possible until 04.00 p.m. the day before the first day of the course. When do I have the right to get my deposit back? In order to get you deposit back, you have to attend a course of ten weeks at least eight times. At a course of five weeks you have to attend at least four times. It doesn’t make a difference whether you have cancelled or not! When you are not attending classes because of colleges, work and other obligations you don’t get your deposit back! You can reclaim your deposit at MyACLO (www.aclosport.nl > Login > Enrollments > click on “guarantee claim”). Now you can collect your deposit at the information desk of the Sports Center or you can use the deposit for the next course enrollment. If I am selected for a course, when do I have to pay the attendance deposit? For all courses you have to pay an attendance deposit of €10,-. If you are selected for a course, you can pay your attendance deposit on Monday, Tuesday or Wednesday in the week before the start of the course. This is possible from Monday 08.00 a.m. until Wednesday 06.00 p.m. at the Sports Center information desk. You can also pay your deposit online at MyACLO. Please note that, when you do not pay your attendance deposit in time, you are not selected for the course anymore! 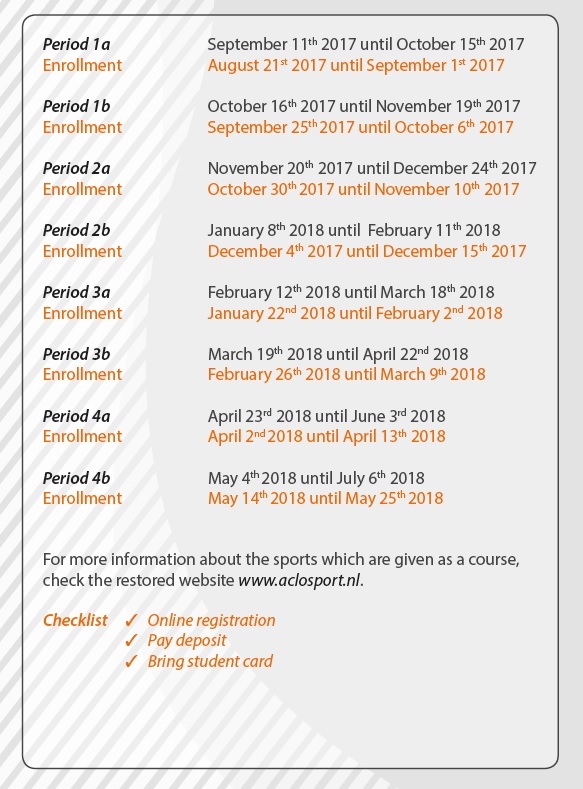 Below you can find an overview of the enrollment periods of the academic year 2017-2018. Which password do I have to use to login to MyACLO? Your password for MyACLO is the one you also use to login to Nestor or Blackboard. When you are not a student at the RUG or Hanze University for Applied Sciences, you can request a password at the login page of MyACLO. You can also visit the information desk of the Sports Center so we can connect your e-mailaddress to a new password. How can I enroll to a course? You can enroll to a course at MyACLO (www.aclosport.nl > Login > Enrollments). What is the fitness introduction? Before you can purchase a Fitness Card you have to possess an ACLO Card and you have to participate in a fitness introduction. Via MyACLO you can register for the fitness introduction, click on ‘whats on offer’ to enroll. When you do the fitness introduction you will learn the rules of the gym. An instructor will assess how capable you are with the machines and exercises and judge if you can use the gym on your own. A teacher can give you guidance if you don’t have much experience. Can I use the fitness facilities at the ACLO? When you want to use the fitness facilities, you have to purchase a Fitness Card besides the regular ACLO Card. A Fitness Card costs €65,-. You can buy the Fitness Card via MyACLO or at the information desk at the ACLO. What do I have to bring to a fitness introduction? You have to bring your student card to the fitness introduction and other moments when you use the fitness facilities. Before you can do the fitness introduction, you have to possess a valid ACLO Card. You have to bring a towel as well. What are the fitness house rules? All users of the fitness facilities have to possess a valid ACLO Card in combination with a Fitness Card. It is not allowed to climb over the entrance. Visitors always have to use a towel. Materials have to be replaced in the same order as found. It’s not permitted to throw the weights. Cardio equipments have to be cleaned after use. Ensure you don’t bother other sporters. What are the fitness opening hours? During holidays there are special opening hours. You can find them here. What are the prices to fitness at the Sports Center? To use the fitness facilities at the Sports Center, you need to purchase an ACLO Card and a Fitness Card. These Cards are valid the whole college year. You can also fitness from Februari. Then you need to purchase a Midseason Card and a Fitness Midseason Card. It is also possible to fitness in the summer. When you purchase a Summer Card and a Fitness Summer Card you can use the fitness facilities from May. What do I have to bring when I’m sporting at the ACLO? When you use the facilities of the Sports Center or ACLO Station, you always have to bring your student card. When we scan your student card, we can see whether you have purchased an ACLO Card or not. What can I do with my ACLO Card and what do I have to pay extra for? I don’t want to be an ACLO-member anymore, what now? Your ACLO Card (or Midseason or Summer Card) is valid until the end of the college year (until September of the following year). When you don’t want to continue sporting at the ACLO the following year, you don’t have to do anything. The ACLO Card stops at the end of the year. Can I rent a sport hall as a non-ACLO-member? If you are not an ACLO member, you can also reserve accommodation at the Sports Center. Send an e-mail for more information to: sportcentrumreserveringen@rug.nl. Where are the sport locations? To find all our locations, click here. For a more precise description of the location of ACLO Station, click here! I’m a SPR-member, where can I find more information? Where can I find the sport locations? Where can I find the ACLO/Sports Center? The Sports Center is located at the Zernike complex (Blauwborgje 16, 9747 AC Groningen). When you want to come by bus you can get a bus number 11 or number 15 from the train station of Groningen (Groningen CS). Get off at the bus stop called “Zernikelaan/Nijenborgh”. Where can I find ACLO Station? ACLO Station is next to the central station (Stationsplein 7, 9726 AC Groningen). Here you can find a picture of the entrance. Where can I find the Willem Alexander Sports Centre (WAS)? Where can I find the Kardinge complex? You can find the Kardinge complex at Kardingerplein 1, 9735 AA Groningen. Where can I find ‘De Bunders’? You can find ‘De Bunders’ at the end of the Zernike complex nearby the Nuclear Physics Accelerator Institute. What do I have to bring to Groups lessons and Open hours? Where can I find more information about the Groups lessons and Open Hours and the Groups Lessons and Open Hours schedules? Groups lessons and Open hours schedules you can find here. Information about the Group lessons and Open hours you can find here. What happens when I am too late during a Groups lesson? When you’re too late, the teacher has the right to refuse you. In the contrary to the groups lessons at the ACLO Sport Centre at the Zernike complex, it is obligated during the groups lessons at ACLO Station to reserve a ticket 48 hours prior the open hour. Here you can find more information about the ticket system. When you’re too late during a groups lesson in ACLO Station, your ticket will be given free. Where can I ask my questions about nutrition or about professional nutrition advice? Where can I go if I have a question about an injury? There is a physiotherapist at the Sports Center. You can find more information on www.fysiokroon.nl or https://www.studentarts.nl/en/ you can also make an appointment. The costs for an appointment are not included in your ACLO Card. The forms are available at the office. Where can I find the Physiotherapists? You can find the practice of the physiotherapist, directly on the right side at the entrance of the Sports Center. To make an appointment you can call 050 363 5569. Where can I find information about the open competitions? You can find information about the open competitions at http://www.aclosport.nl/en/sports/open-competitions/. For questions you can send an e-mail to ic@aclosport.nl. Do I have to bring my own sport materials, like balls or rackets, when I reserve a court? You can bring your own material. When you don’t have a racket or balls you can rent or buy these at the desk of the Sports Center. I cannot make an online reservation. What can I do? When you cannot make an online reservation, you can contact the Sports Center information desk: 050 363 8063. You can call this number from Monday till Friday from 08.00 a.m. until 11.00 p.m., on Saturday from 09.00 a.m. until 09.00 p.m. and on Sunday from 10.00 a.m. until 09.00 p.m. It is possible to cancel your reservation online (Bookings > current reservations), until three hours before the start of the reservation. You cannot cancel a reservation between 11.00 p.m. and 08.00 a.m., so when you want to undo a reservation at 10.00 a.m., you have to cancel the day before. You can also cancel a reservation by calling 050 363 8063, or at the information desk of the Sports Centre. This is possible until two hours before the reservation. Does my tennis- or squash buddy has to be an ACLO-member as well? How can I reserve accommodation for large groups/sports clubs? You can call 050 363 8063 to reserve sports halls, sports fields, and other accommodations of the Sports Center. When you are going to sport with a large group, everyone should be extend his students card at the information desk. Do you want to reserve accommodation as a non-ACLO-member, send an e-mail to sportcentrumreserveringen@rug.nl for more information. You can make an online reservation at MyACLO. You can also make a reservation at the information desk at the Sports Centre (telephone number: 050 363 8063). It’s not possible to sign in, due to the error Disallowed Key Characters. What should I do? How can I login at MyACLO? Go to MyACLO (click on login via aclosport.nl/en); click on the logo of your education institute (RUG or Hanze) and fill in your student number and password. When you are not a RUG or Hanze student, you need to visit the information desk at the Sports Center so they can connect your e-mailaddress to an account. Thereafter, you can login at the blue logo ‘other’.